Ceroxylon interruptum on a misty mountainside, Caracas, Venezuela. Do you know what is the hardiest palm in the world? No, not Trachy or Chamaerops. It's the Needle Palm, Rhapidophyllum hystrix. A splendid introduction to this little known palm. If Tree Ferns are your thing, then a trip to this wonderful island could just be the holiday you've been dreaming of. A palm that's about to become very popular, and so beautiful it shouldn't be a Phoenix palm at all. Next time you're on one of the 'Costas' in Spain, do try to visit this old and very atmospheric garden, justly famous. 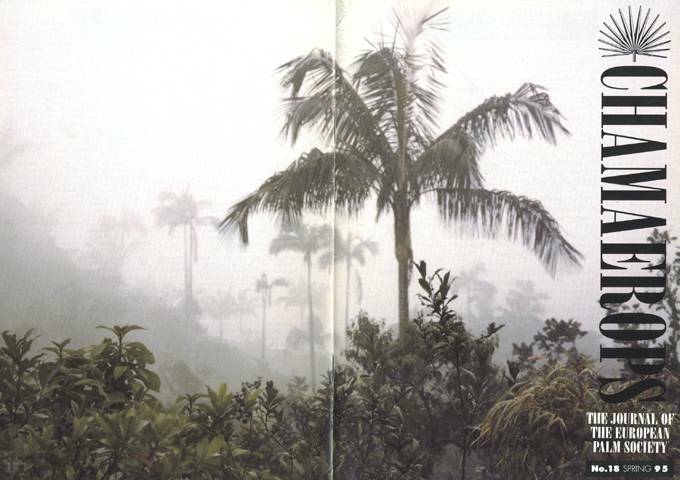 Many will know of New Zealander Keith through his book, 'Palms & Cycads Beyond the Tropics'. This is an account of some of his experiences collecting such first hand information. Follow Rainer's progress in creating an exotic garden in central Germany.